Ganozhi™ Soap is specially formulated and enriched with Ganoderma extract and palm oil. We are a top notch supplier of Ganoderma Soap. 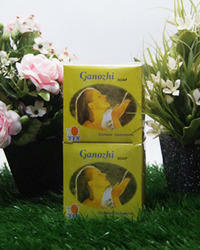 Ganozhi™ Soap is specially formulated and enriched with Ganoderma extract and palm oil. It gently cleanses the skin while preserving its natural oils without damaging skin structure. The use of palm oil enriched with vitamin E and anti-oxidant agents helps to revitalize your skin and delays the aging process. Ideal For: make your skin radiant, supple andsmooth. Reishi Soap, a bath soap with Ganoderma Mushroom Extract which makes your skin radiant, supple and smooth. It is suitable for all types of skin. Daehsan Trading (India) Pvt. Ltd.
Our reputed entity is engaged in supplying Ganoderma Soap. Our company has been successful in winning appreciation from the clients as one of the most prominent names in the trading of Ganoderma Soap. It is specially formulated and enriched with Ganoderma extract in palm oil. It is rich in Vitamin E and anti-oxidants. It gently cleanses the skin while preserving its natural oil without damaging the skin structure. It gives your skin a soft and silky feeling and keeps it always young. Ganozhi soap is specially formulated and enriched with Ganoderma extract and palm oil. It gently cleanses the skin while preserving its natural oils without damaging skin structure. Ganozhi Soap is specially formulated and enriched with Ganoderma extract in palm oil. It is rich in Vitamin E and anti-oxidants. It gently cleanses the skin while preserving its natural oil without damaging the skin structure.